If we're going to be moving primary residence and all of our possessions on a regular basis, we need to be able to do it safely for ourselves, our house, and everyone else on the road. 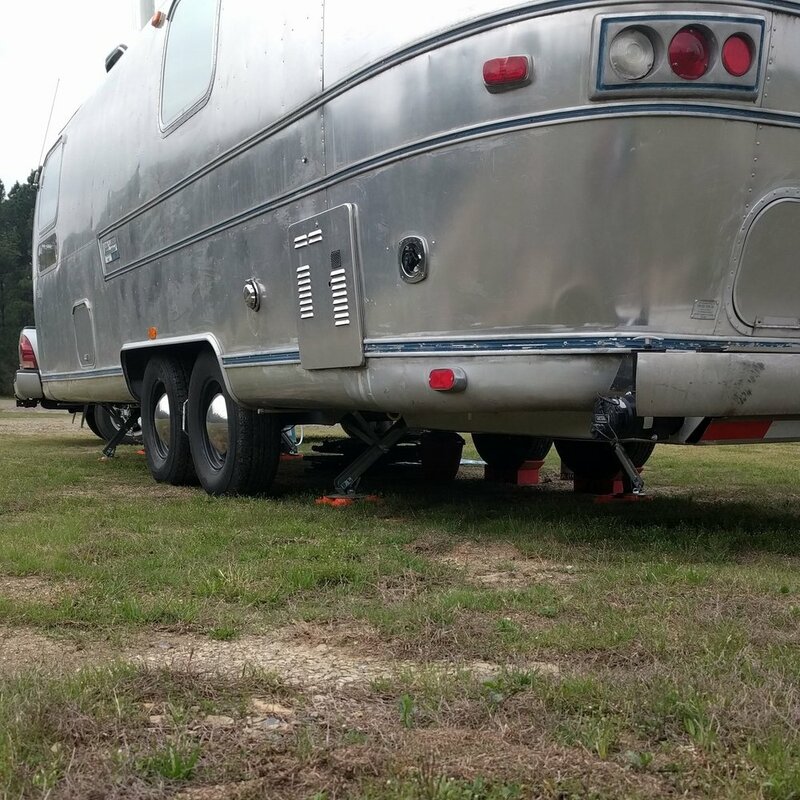 Towing an Airstream isn't as simple as dropping it on the ball and rolling down the road. And parking safely and comfortably requires some gear, too. Before you tow a large trailer like an Airstream, it's important to understand two separate concepts: weight distribution, and trailer sway. Weight distribution is how the weight of the trailer is transferred to your tow vehicle and trailer axles. If you just use a ball hitch with no extra equipment, all the weight of the trailer is going to sit behind your tow vehicle's back wheels and lift your front wheels off the ground. If you have a F-350 or similar giant truck, this is less of a problem. But it's a big deal for my Tacoma. A weight distribution hitch uses jacks and springs to twist the hitch down and forward, which pushes the truck's front wheels into the ground and lifts the truck's rear wheels. Properly set up weight distribution will evenly distribute the trailer's weight to both axles of the truck instead of just the rear. Trailer sway is a serious hazard when towing a large trailer like an Airstream. If you're driving down the highway at 60 mph and a big gust of wind hits the trailer, or maybe a big truck drives by, the trailer can get pushed to the side. Since it pivots on the ball hitch, if the trailer gets pushed to the right, it'll steer the truck to the right, sometimes straight into the ditch. The ProPride hitch is one of many devices that addresses both weight distribution and trailer sway. All weight distribution hitches seem to work the same way, but while most sway control hitches use friction bars, both the ProPride and Hensley hitch use some interesting engineering to eliminate (not just control) sway. I won't get into the physics here, so suffice to say, it works. I chose the ProPride over the Hensley because of customer feedback via Airforums, better build quality, and most importantly, customer service. I filled out a form on ProPride's website at 7:30 at night, and had an email from Sean Woodruff in my inbox in four minutes. I replied to the email, and he responded in under 60 seconds. I replied again and he responded in under 30 seconds. I have no idea where Sean finds the energy to provide that sort of customer service, much less off-hours (though I like to imagine him sitting at his desk with a giant pile of stimulants, Scarface style). If I'm going to invest that much money in a safety device, I'm going to invest it in the guy who is going to make responding to my questions a priority. This scissor jack socket along with a cordless drill makes adjusting the leveling jacks on our hitch much easier. Don't use it with an impact drill, since that could damage the jacks. This modification is something that vintage purists will hate, but gives me peace of mind. This LED bar is nice and bright, and should help with one of my worst fears on this project—getting rear ended by a truck that would put our house out of commission for weeks, months, or forever. I was hoping to wire this to be exclusively a third brake light, but the way the trailer is wired, that would require some modification. There's no dedicated brake light wire in the trailer. There's a wire for running lights, one for the right turn signal, and one for the left turn signal. Running lights are on all the time, and when you hit the brakes, both turn signals light up, which gives you your brake signal. Since there's no dedicated wire for the brake lights, to make this thing light up for the brakes alone, I'd need to wire a 12v normally open relay to one turn signal +, wire the switched circuit on the relay to the other signal +, then wire all three power leads on the light bar to the other side of the switched circuit off the relay. That way, one turn signal would close a circuit in the relay, which would allow power to travel from the other turn signal wire to the light bar, so the light would only light up when both turn signals were powered simultaneously (i.e. a brake signal). More trouble than I cared to bother with when I installed it, so it's wired up as illustrated on the vendor's website. I'm growing to appreciate having a more conspicuous turn signal. One of the first upgrades I made to the Airstream was to install these tail lights. I do NOT recommend this product. The plastic lenses and screws are fine, but the LED lights themselves are garbage. The red light uses a white bulb, which results in a washed out red color, which makes the light look dim. You can see the effect in the picture on the site. Also, the bulbs are attached to the plastic lenses with some clear silicone that falls off pretty easily, so the bulb is just bouncing around in the housing. Finally, the fiber optics won't work with these because they only shine light outward. I'm keeping the white backup lights as they are for now, but I replaced the red tail/turn lights with a different bulb. If you want to upgrade your tail lights to LEDs, save your money and check out the links below. The fiber optics will work with these bulbs. For the best color and brightness, match the color of the bulb with the color of the lens: e.g. put a red bulb under a red lens. Use the dual function for tail/turn signal and the single function for reverse and scare lights. The replacement tail light cans from VTS are better than the originals because they're aluminum, so they won't rust like the old ones. Drill a 1/2" hole just behind the bulb for the fiber optics. I also replaced all my running lights with LEDs. These are pretty simple direct replacements. One wire to crimp -- the negative side grounds to the trailer. Put the levelers in front of the tires on the low side, then drive forward until your Giant Level tells you you're level side-to-side. Add the second piece behind the wheel, and your wheels are leveled and choked. We have a tandem axle trailer, so we like to use a BAL X-Chock on the other side to lock the other set of wheels. Having your wheels tightly chocked makes a big difference in how much the trailer bounces around when you're inside. We do still have a set of lego block style Lynx leveling blocks, but we mostly use them under the tongue jack and the stabilizer jacks to distribute the load and prevent damage to whatever pavement we're parked on. This scissor jack socket in a cordless drill makes deploying the stabilizer jacks a snap, and it also fits the weight distribution jacks on our hitch.